Malabrigo (top red circle) in Santa Fe Province is 375 miles north of Buenos Aires). 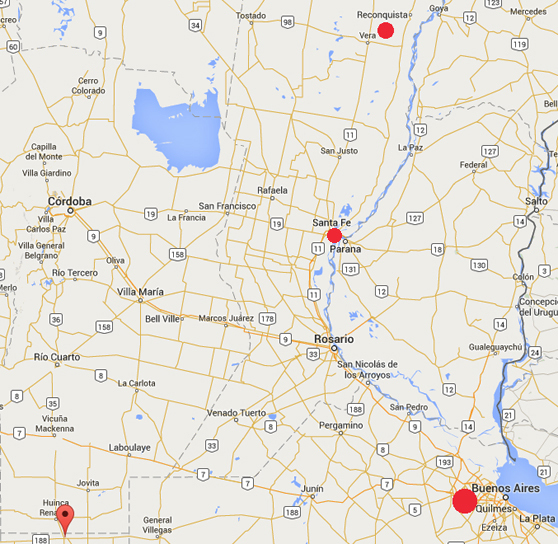 Realico in La Pampa Province is 437 miles west of Buenos Aires (lower left Google pointer). Both Malabrigo and Realico have had repeated cycles of animal mutilations since the early 2000s and La Pampa Province has had the most reported animal mutilations. Santa Fe is the capital city of the province of Santa Fe, Argentina,with a population of 500,000 near the junction of the Paraná and Salado rivers. Santa Fe Province has had lots of animal mutilations, too, and is linked by National Route 11 to the Sauce Viejo Airport with daily direct flights to Rosario and Buenos Aires. May 19, 2015 Malabrigo and Realico, Argentina - A large cycle of animal mutilations in Argentina began in April 2002, when more than 100 mutilated cows and horses were reported to Argentina's federal INTA agency, similar to the U. S. Department of Agriculture's Food Safety Inspection Service.